Personalized Shirts for boot camp graduation and/or Meet and Greet. The design is embroidered over the heart and is done in bright colors that you choose. Just choose your shirt color, style, and size then choose the thread colors for the design. These designs are embroidered not screen printed so they are made to last. 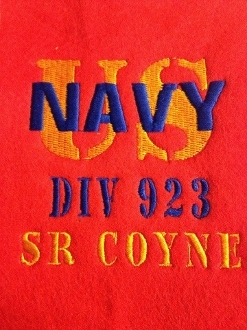 You get the design with your division number and you can even add your Sailors name if you like. The choices for this shirt are endless. The shirts are co-ed sized to fit men and women so take that into consideration when choosing the size that fits you best.